In the previous two editions of Design Dictionary, we discussed the characteristics of Hepplewhite and Sheratonfurniture. Now it’s Chippendale’s turn. Thomas Chippendale was the earliest designer of the three. He lived in England from 1718 to 1779. He was responsible for publishing the first pattern book of its kind, The Gentleman and Cabinet Maker’s Director. The term “Chippendale” comes from the designs in that book. Chippendale was the first person other than a monarch to have a furniture style named after him. While Thomas Chippendale may not have created every design published in the book, he is widely considered responsible for the best ones. “Director” (the book’s nickname) was well-recevied. Furniture makers in England, the continent, Ireland and the American colonies all crafted furniture based on it. There are 3 types of Chippendale furniture. The first type is the English version of the Rococo style. It is called “modern” in the Director pattern book. When people say “Chippendale, ” without any other qualifiers, this is what they mean. It refers to furniture first made in England in the 1750s and 60s. The second category of Chippendale furniture is the Gothic Chippendale style. Chinese Chippendale is the third type. Unlike Sheraton and Hepplewhite furniture, almost all antique Chippendale furniture is mahogany and does not use veneers. Let’s look more closely at the three types. A curvy Chippendale sofa showing s-curves, cabriole leg and ball and claw foot. Chippendale’s rococo designs are in part a reaction to the heavily Baroque styles of William Kent in who died in 1748. Chippendale often modified French designs to appeal to the more conservative English market. Many of his chairs were based on designs from the Louis XV period. Chippendale’s most iconic chair, the ribbon-back (or ribband) chair falls in this category. Look for these characteristics to identify Chippendale furniture: Chairs and sofas had a broad seat. Chair backs had pierced splats and an outward flaring at the sides. Cabriole legs were prevalent and frequently terminated in a a ball and claw foot. Furniture featured carved decoration in the Rococo’s “S-scrolls”. Sometimes the legs were straight and square. This shape is called a Marlborough leg. Hardware on case pieces often had a “bat-wing” shape. 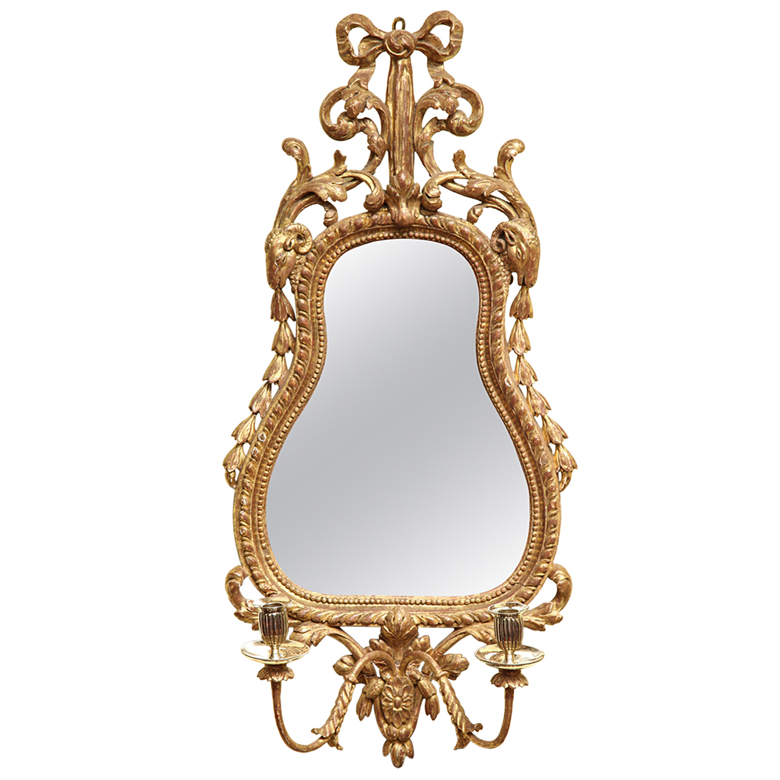 Chippendale’s most elaborate designs in this modified Rococo style are both heavily carved and gilded and include mirror frames, girandoles and console tables. Fretwork characterized the Chinese Chippendale style. On tables, it forms a gallery around the tabletop. 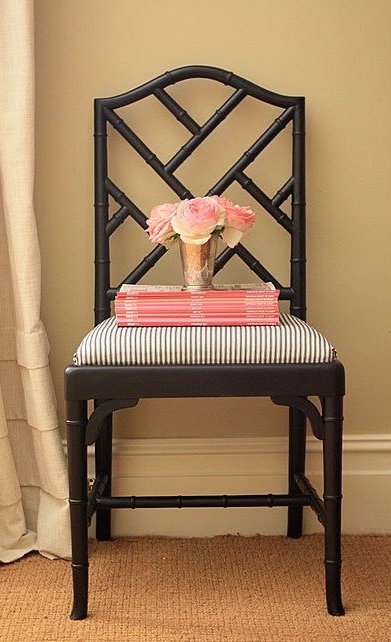 Fretwork also decorates legs and the backs of chairs. China cabinets often had glazing bars (the wood tracery holding the glass) on the windows with a fretwork design. In addition, sometimes pediments in the shape of a Chinese pagoda adorned the top of furniture. Asian style lacquer and designs (called japanning) decorated some Chinese Chippendale furniture. 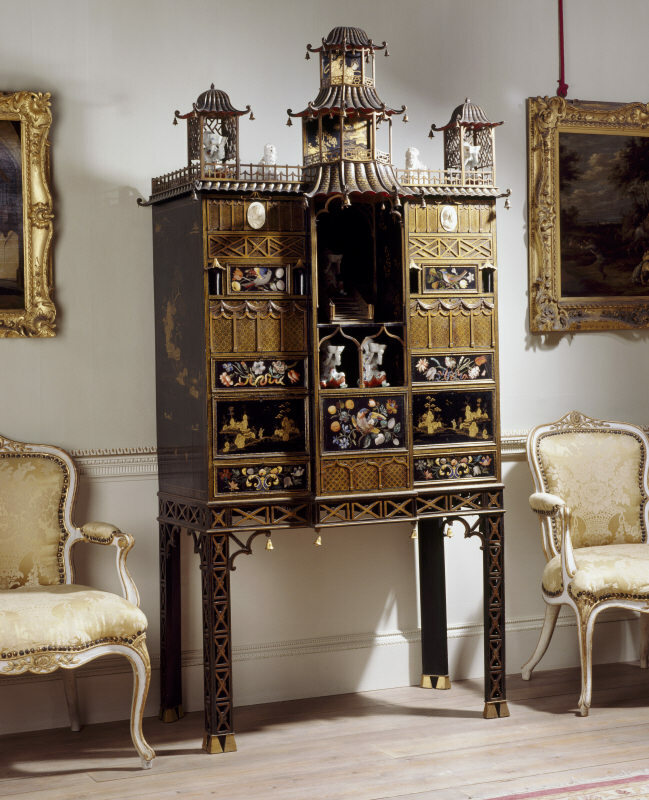 Gothic Chippendale furniture borrowed motifs from medieval ecclesiastic architecture. Chair backs had pointed arches or quatrefoils that resembled gothic window tracery, and legs sometimes took the form of clustered columns. In addition, tracery also decorated cabinet fronts and sometimes the sides of case pieces. Ogee (s-shaped) curves decorated the pediments on massive bookcases. Some legs had ogee curves too. Thomas Chippendale’s son, known as Thomas Chippendale, the younger(1749–1822). continued the business after his father’s death. He worked in the Neo-classical and Regency styles—topics for another post. Photo credits: first image interior design by Steven Gambrel ribband chairs mirror Chippendale chest with bat-wing hardware Chinese Chippendale Settee Chinese Chippendale tea table. Japanned cabinet Pair of Gothic Chippendale chairs. Christies.